This is the absolute bestseller. Freebird One is simply the biggest and the most comfortable catamaran in Tenerife and we suggest you to choose 4,5 h trip to Masca Bay not just for a warranty that you will see pilot whales, but also because it is extremely nice sightseeing of the highest cliffs in Atlantic Ocean from the open water. This trip includes unlimited food (at least 2 hot dishes and one of them is paella), snacks, unlimited refreshing drinks and water, as well as unlimited alcohol (bear and wine). Since the Freebird One is really huge, being a catamaran, it is very stable and safe in the open ocean and we recommend it as one of the best options for a persons with seasick problem. 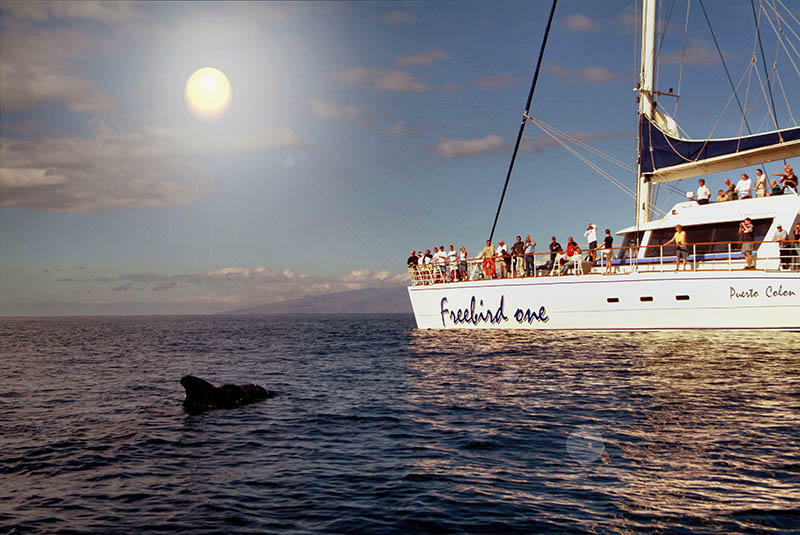 Freebird One will make a stops by the way for swimming and snorkeling. At one of the stops by Callao Salvaje you have very high chances to sea giant sea tortles, living there. You can also swim in blue waters by the grots of the cliffs and by Masca Bay. And what is the most important, with this tour we can give you a warranty, you will see pilot whales very close to you. In order to make your booking of FREEBIRD ONE Catamaran Boat Trips in Tenerife easy and comfortable Tenerife Host use the most advanced and user friendly booking platform TripsPoint.com where you can easily check last actual prices, the tour availability, required booking deposit and book this tour. 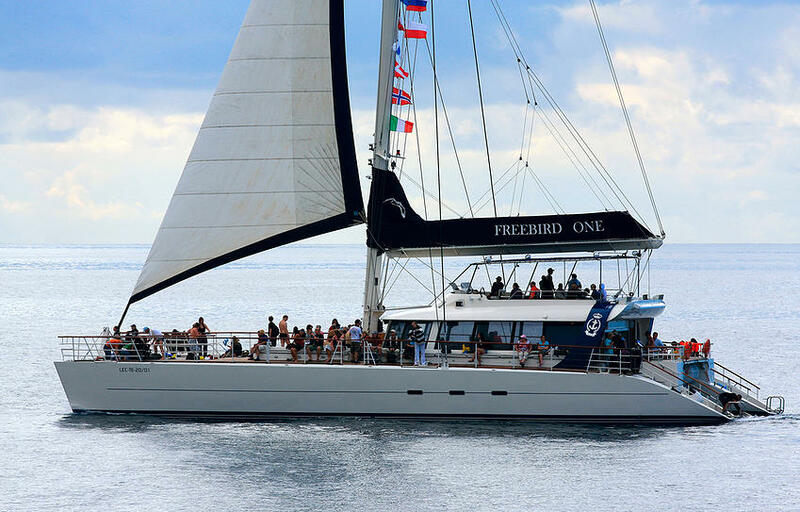 To get more information of FREEBIRD ONE Catamaran Boat Trips in Tenerife and do booking, please, click the button ‘Book Now’. You will be taken to the tour page at TripsPoint.com where you can easily book the tour. Once the booking of FREEBIRD ONE Catamaran Boat Trips in Tenerife made at TripsPoint you will get your tour Voucher / booking confirmation with all details, including exact pick-up point, pick-up time, pick-up point map. 29.50€ – per child up to 11 years old. The price include 4 hours 30 min sea trip, Whales & Dolphins watching, unlimited meals and drinks, including beer and wine. A warranty to see pilot whales.